Do you ever walk into your kitchen, feel like giving up, turn around and walk back out? But it’s not because my kitchen is clean all the time. Ha! What a joke. I would love for it to stay clean all the time. But I have 6 children, 1 husband, myself and siblings that come over plus friends and hey — we use our kitchen, so it can’t stay clean all the time. Here’s another angle of the same night. Every counter is covered including the stove and my kitchen table. The thought of cleaning that could easily be overwhelming. You see, I had the bright idea of making individual homemade pot pies. Yes, from scratch. Yes, individual. As in: made to order. Note to self: They were tasty, but took way too much time and made my kitchen a disaster. Think twice before doing it again. So why don’t I feel awful about my kitchen anymore? Because I’ve changed the way I clean it. Ready to change the way you clean your kitchen? Then read on. It means you’re ready. And you’ve got to be ready, baby! I’ll break it down into steps for you. I’m not kidding. Go get it. And use it. Don’t neglect this step. Set your timer for 15 minutes. When the timer goes off, take a step back and look at what you’ve accomplished. I promise you’ll get more done than you think you will. Give yourself a pat on the back, smile and then either go do something else for 15 minutes, or clean more of your kitchen for 15 minutes. It’s so much easier to clean your kitchen if your dishwasher is ready to receive dirty dishes. Otherwise they just pile up on the counters. So put away those clean dishes first! If you don’t have a dishwasher, then empty your dish drainer or whatever you use. I know people who use the same washcloth and kitchen towel over and over and over again. Talk about gross! Think about it: if your underwear was soiled, would you wear it the next day and the next day and the next day before putting it in the laundry? OK, so maybe that isn’t a fair comparison. But think about it. Don’t use a gross washcloth from the day before to wipe counters off. Eeewww. What can I possibly mean by that? It doesn’t mean to clean like a robot, in case you’re wondering. It means starting with the flat space that means the most to you. That’s the kitchen table for me. If my kitchen table is clean, the rest of my kitchen feels cleaner. What’s that spot for you? Start there. After my kitchen table is cleared off, I wipe it down with the clean washcloth. Then I go to the next spot, which is my counter tops. I have 4 separate counters. And I only clean 1 at a time. Chant that to yourself: one at a time, one at a time. This is what keeps me from getting overwhelmed. If I try to clean my kitchen without some type of organizational thought to it, then I find that I waste time and mostly move stuff from one place to another. It takes longer and I feel as if I’m not making any progress at all. So to sum up this step: I start with my kitchen table then move to my counter tops, then my stove. I save all the stuff that has to be hand-washed til last. Since my dishwasher is empty, the 1st thing I do is clear the surface of dirty dishes and load them straight into the dishwasher. Then I put food away, deal with the paper clutter, wipe it down, etc. until that surface is clean. Only then do I move on to the next surface. When my timer goes off, I stop. 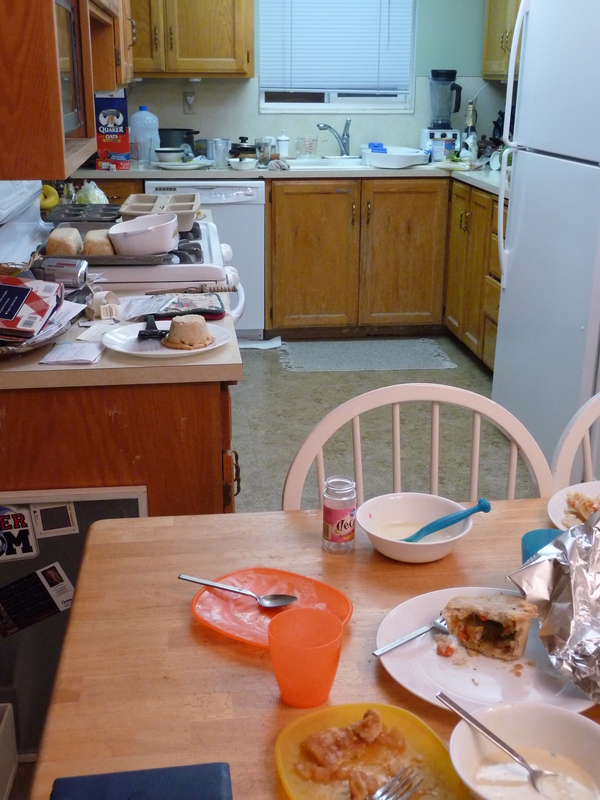 I leave the kitchen (unless I’m under some time restraint to have it clean) and go do something else for 15 minutes. When I come back to the kitchen, I’m ready to hit it hard again. Because I’m not staring at my entire dirty kitchen, but only focusing on 1 surface at a time, I don’t get overwhelmed. I’ve broken it down into smaller, more manageable steps. OK, now it’s your turn. Let me know if this works for you! This entry was posted in Cleaning, Organizing and tagged cleaning, kitchen, timer. Bookmark the permalink. Thanks! I do feel overwhelmed about the kitchen. These are very good ideas!